I love me some greek yogurt. I eat it almost every single day for a snack, usually plain with fruit or other mixins added it. When I go for the flavored kind, my favorite is Chobani, hands down. I like that they have real fruit or honey at the bottom, rather than some of the other kinds where you pour the jelly like substance over the plain yogurt. So when the folks over at Chobani offered to send me a custom case, I couldn’t turn it down! The Plain nonfat container has 2 pts+, and most of the flavored nonfat ones have 3pts. The 2% has 3 pts+ for the plain, and most of hte flavored 2% has 4pts+, which is not bad at all. I don’t normally buy the flavored kinds, but I must admit – it’s been so convenient to just grab a container and not have to get anything else to put in it! One of the new-to-me flavors I got to try was the 2% Blood Orange. It was DELICIOUS. I loved the tangy-sweet blood orange chunks at the bottom – it was the perfect balance! And the other new-to-me favorite flavors were 0% Pineapple and the 2% Mango – both so, so good. What better way to start the day after a long weekend than with a giveaway!? One lucky reader will win your own customized case of Chobani, based on your personal preferences! To enter, leave a comment on this post telling me your favorite way to eat greek yogurt! Contest ends at 12am EST on Thursday, May 31st. I’ll announce the winner on Friday morning. Good luck!! Finally Friday – woohoo! It’s funny because I woke up yesterday barely believing it was already Thursday, but then the week stopped in its tracks and I’ve been on the edge of my seat waiting for today… and here it is. And it’s going to be a nice one, too. Somehow, tomorrow marks the one year anniversary of Beth’s Journey! I can’t believe it’s been a whole year, but at the same time I love the blog so much that I can’t really picture things without it in my life at this point. All the amazing people I have met, emailed with, opportunities that have come from it… it just blows my mind. It’s scary looking back to my blog one year ago and how far I’ve come with it in terms of my writing, photos, and posting style – I honestly can’t believe anyone used to read it back then! So in honor of the one year anniversary, I thought it would be the perfect time to host the first giveaway I’ve done in a long time, and this one’s a good one! You guys must know how much I love Greek yogurt by now. I only discovered it in the last two years or so, and I’ll never go back to regular kind. The thick, creamy texture just can’t compare to regular yogurt, and the protein that it packs keeps me full for hours. I love using plain Greek yogurt as a substitute for sour cream or cream cheese in lots of recipes, and have Greek yogurt for breakfast, an afternoon snack, or in a sauce almost every single day. It’s one of the things I always have on hand and has been truly instrumental in my healthy lifestyle. When Chobani reached out about sampling their new flavors, of course I jumped at the chance, especially when they told me what the flavors were. 0% Black Cherry, 2% Mango, and 0% Lemon. Each of these flavors has 4 pts+ per container and packs between 13-15 grams of protein. 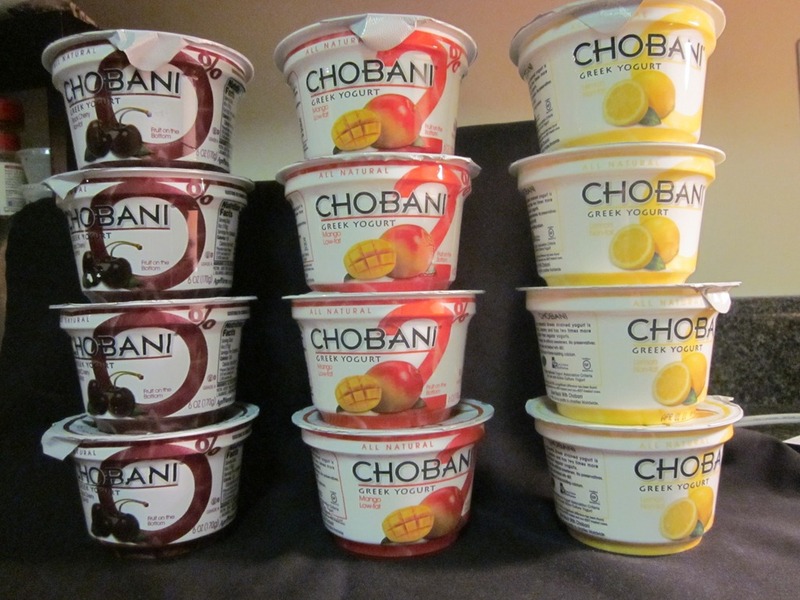 Chobani is my favorite kind of flavored Greek yogurt, and these new flavors are amazing. My favorite of the three is the Lemon, which actually surprised me. There’s little bits of lemon zest in the yogurt and its literally like heaven in a cup. The Black Cherry and Mango are also so delicious, both with chunks of real fruit, and tie for second place. Like the Chobani Facebook page and leave a comment telling me you did. Visit the Chobani website and leave a comment telling me the flavor you’d most like to try. Leave a comment asking me anything you’d like to know about me, anything you’d like me you address on the blog, or something you’d like to see on Beth’s Journey in the future that I don’t do now. Each person can enter up to three times. Giveaway runs through midnight EST on Tuesday, February 22nd, and I’ll announce the winner Wednesday morning. Good luck! Happy Tuesday! I finally got to try the Caramel Oikos for breakfast today and omg it is so good. It is seriously hard to believe this is all natural! The yogurt is so thicky and creamy, and the caramel so gooey, its an awesome balance. I sliced up a Fuji Apple and dipped it into the yogurt and it was delicious. Want to lick the container clean so I don’t miss any sort of good. I was hungry when I woke up today (again) so I actually ate breakfast at home for a change, but I have a juicy pear to eat when I get hungry again. And now, for my very first blog giveaway! The people over at Stonyfield have decided to give one my of my readers an Oikos reusable tote bag and 5 coupons for free Oikos yogurt! 2.) Subscribe to Beth’s Journey on Google Reader or by email (lower right hand corner of the Home Page) and leave another comment on this post letting me know you have. 3.) If you have a blog, write about this giveaway and link back to this post on your blog, and leave another comment on this post saying that you did. Giveaway starts now and runs through 5pm on Thursday, March 25th. I will pick a random winner and announce it Friday morning.